Can I pick the colour of my card? We have launched slick, new, redesigned cards that speak to the vibrancy of future goals and to the colourful hues of everyday life. 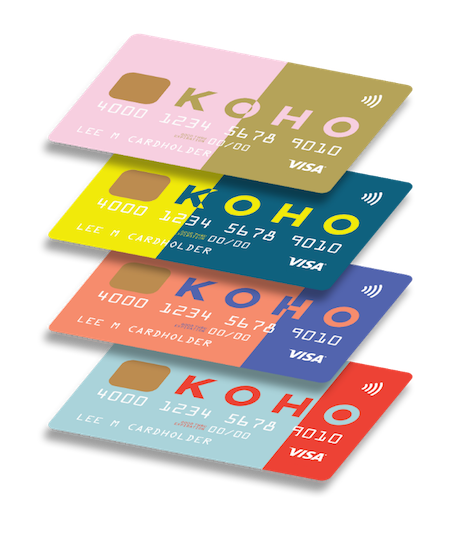 For new users: when you sign up for KOHO you’ll have the chance to choose the card you want. You’ve got 4 bangin’ combinations to choose from: Gilded Cotton Candy, Sunkissed Skinny Dip, Blueberried Caviar, and Frozen Cherry Soda! For existing users: you can reach out to us via our in-app chat if you want a new card! Note that if you’d like to keep the trusty one you’ve got, that’s totally cool too. If you’ve moved since signing up to KOHO, make sure we have your current address. Once you activate your new card by calling 1-855-564-6999, your balance, PowerUps, and savings goals will all instantly transfer over. Technology!